Can mayonnaise bring peace between two warring countries? Probably not, but it can certainly spread trouble: Georgian government officials are under fire for appearing in a Russian mayonnaise advertisement. 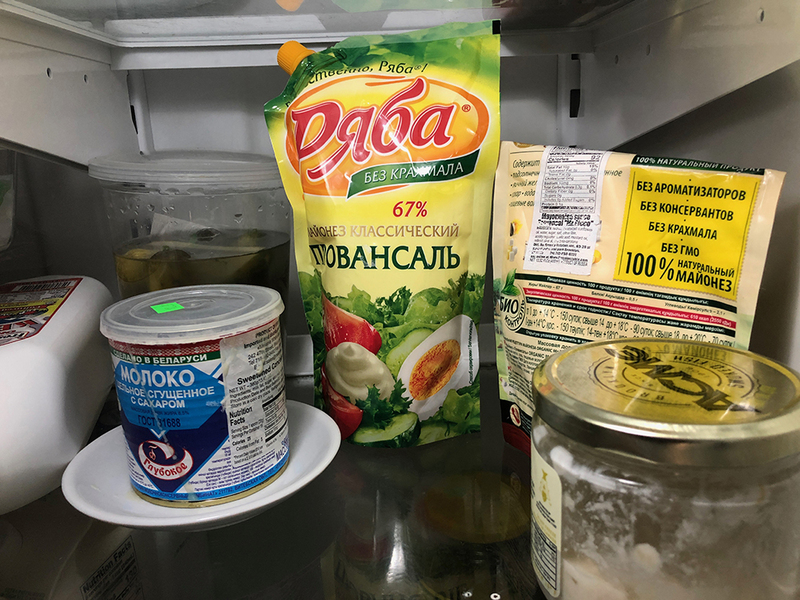 Three famously easy-on-the-eyes spokeswomen for key government offices – the defense ministry, presidential administration and the National Revenue Service – appeared in a glossy magazine advertisement for Sloboda, an omnipresent post-Soviet mayonnaise. It might have been the worst PR move in their careers. The officials faced a public outcry for promoting an enemy product, as Russia is Georgia’s number one geopolitical foe. Moscow has long been peeved by Georgia’s Western integration aspirations and the two countries have not been on speaking terms diplomatically since they fought a war in 2008. Still, the Russian condiment managed to seep into the very core of Georgia’s state apparatus. “Next they should star in a commercial for Russian tanks,” fumed one commenter on the Facebook page of City, the magazine that published the advertisement. “They are supposed to promote the Georgian government, but instead they promote Russian mayonnaise. Shame!” complained another. Amid the furor, the City Georgia magazine hurried to remove the photo of the ad and the commentary it triggered from its Facebook page, but the screenshots of the ad lived on among irate Georgians. The officials claimed they were not aware that they were promoting enemy mayonnaise. “I didn’t know that Sloboda was a Russian company, I thought it was Ukrainian,” one of the spokeswomen, the defense ministry’s Nino Tolordava told Netgazeti, a news website. She used the opportunity to reiterate her commitment to Georgia’s NATO integration, a plan that the mayo-making Russia ardently opposes. The editor of City, Nino Khoperia, claimed that she did not mislead anyone into promoting the anti-Euro-Atlantic mayo. Sloboda sponsored an entire segment in the magazine’s latest issue and the dressing was product-placed in a photo featuring the officials, she said. “Perhaps we should not have done it given their positions,” Khoperia admitted in a comment to the news site On.ge. ეკა ხოფერია ამბობს, რომ არავინ მოუტყუებიათ, თუმცა, მისი აზრით, ეს რეკლამა არ იყო. Some readers found these claims unconvincing and suspect that the officials were paid for the ad. Eka Mishveladze, the spokesperson for the president’s office, insisted that she had no idea that her photo was meant to be an ad. She said she also thought Sloboda was a product of Ukraine, Georgia’s ally in its confrontation with Russia. “Of course I think that promoting the occupant country’s products is a problem,” Mishveladze told Netgazeti. Georgia considers Russia an occupant for its military support to two breakaway territories, Abkhazia and South Ossetia. Russian soldiers have been putting up walls and barbed wires across Georgian territory to fence South Ossetia off from Georgia. The Russian-made border – known as the “occupation line” in Georgia – cuts through villages and even homesteads, and allegedly creeps into Georgia beyond the territory under dispute. For all these tensions, gastronomic relations flourish between the two countries. Russia is the largest market for Georgia’s export staples like wine and mineral water, and Russian produce, including the controversial mayonnaise, is available in Georgia. Many Georgians don’t mind putting a bit of Russia into their food, but others, as in Ukraine, engage in personal boycotts of all things Russian. The larger point is that while Georgia and Ukraine struggle to slip from under Russian control, there are things that continue to tie these countries together, such as their shared faith, cultural and economic ties, and culinary preferences. Mayonnaise, once a must on the dinner tables of the Soviet Union, remains dear to the hearts and stomachs of its successor states regardless of geopolitical conflicts that divide them.